Jobu reviews the Yankees series in the nation’s capital against the Washington Nationals. Coming into this series, the Yankees had won six games in a row against the National League East, and sixteen of the last twenty games overall. This had propelled them into sole possession of first place in the American League East. The Nationals, meanwhile, had also won six in a row and they also held first place in their division, so this was going to be quite the battle. Unfortunately for both of these teams, their aces (CC Sabathia and Stephen Strasburg respectively) were not scheduled to pitch in the series, but each team has enough weapons to make any series competitive. 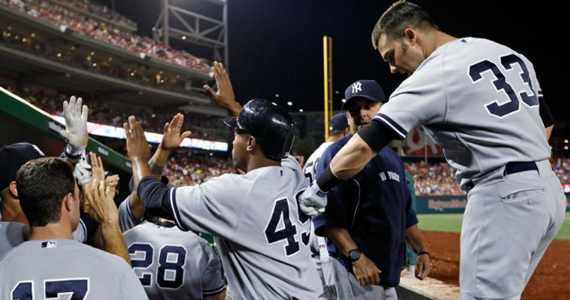 In the end, the Yankees swept the Nationals for their third straight series sweep. Here’s how it all went down. The final score is not indicative of how close a game this really was. Through the first six innings, Gio González and Phil Hughes were involved in quite the pitcher’s duel. It wasn’t until the bullpen came in that they Yankees bats feasted and put this game away. Hughes put together yet another solid outing in this one. He continues to prove the doubters wrong with his arm, as he works his way back to relevancy in the organization. In this start, he finally managed to keep the ball in the ballpark, breaking his twelve start string and falling just short of the Yankees record (14 starts). He can always start a new string next time, right? All kidding aside though, Hughes was pretty spot on in this game. The only run he allowed came in the bottom of the third when he loaded the bases, allowed an RBI single to Mike Morse, but then got a huge double play to escape the jam. His final line looked like this: 6 Ip, 6 H, 1 R, 2 BBs, 9 Ks, 107 pitches and his seventh win of the season. As I said earlier, this game was not a blowout from start to finish. During the first six innings, the Yankees only managed two runs on four hits and two walks against González. Both of those runs came in the top of the third on RBI singles by Alex Rodríguez and Nick Swisher. The inning might have continued, but A-Rod made a terrible base running blunder on Swisher’s hit and got caught too far off of second base after rounding it, and the inning ended. 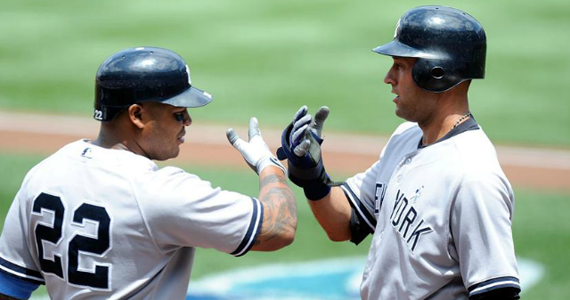 The Yankees offense did most of their damage in the top of the seventh inning. Andruw Jones singled to lead things off, which spelled the end of the day for Gio. He was replaced with Brad Lidge, which turned out to be a big mistake. Dewayne Wise pinch ran for Jones and stole second before Russell Martin walked and Jayson Nix bunted them to second and third. We haven’t complained about Girardi in a while (winning helps), but he interestingly chose to send up Robinson Canó to pinch hit for the pitcher. With first base open, the Nationals (obviously) walked him intentionally to load the bases. Derek Jeter came up next and singled in Wise and Martin (although Martin scored on an error by the SS) to make it a 4-1 game. Granderson came up next and doubled to left (he has more opposite field hits this year than he did all of last year), which scored Canó and Jeter for a 6-1 lead, which was really all she wrote for this game. One interesting note: The Yankees were on their way to winning their first game of the season without the use of a home run (they were 0-12 coming into the game) but Granderson ruined it by hitting his 20th home run of the year in the top of the ninth. Kinda jerky, Curtis. Although, that record wouldn’t stand through the end of the series anyway. If you were hoping for a lot of baseball on Saturday afternoon, boy were you happy with this game. The game, which featured Andy Pettitte taking the hill against one of the better young starters in the league in Jordan Zimmermann, started at 1:05pm and didn’t end until four hours and 49 minutes later. The nearly five hour game went fourteen innings, as both bullpens pitched incredibly well. In the end, Brad Lidge was to blame yet again (he actually got released after the game), as he allowed a big two-run double to Teixeira for the win. It’s getting to the point where it is now surprising when Andy Pettitte has a rough outing (not that he’s had any really rough ones), instead of when he pitches well, like it was at the beginning of his comeback. One day after turning forty, Andy continued pitching like a kid, holding the Nationals at bay and out-pitching a kid who probably grew up watching him pitch. The only blemish in Andy’s seven strong innings was a broken-bat two-run double off the wall by Jesús Flores in the bottom of the third. I’m not sure how the ball almost went out of the ballpark. The bat broke, and as the good folks at Riverave Blues said, Flores has no business ever hitting a ball that far. After that, Old Man Pettitte settled in, and his final line looked like this: 7 Ip, 5 H, 2 R, 3 BBs, 6 Ks, and 95 pitches. He left with a lead, and a chance at his fourth victory of the season, but it wasn’t meant to be. Still a great outing by the 40-year old. We haven’t talked about the bullpen dominance in a while, not because it hasn’t been dominant, but because they haven’t had to pitch more than one or two innings in the last month or so because the Yankees’ starting pitching has been so good. This game started out with a blown save for the pen, but developed into one of the best bullpen performances of the season for the Yanks. Let’s get the bad out of the way. Cory Wade came in to pitch the eighth (David Robertson is back from injury, but still working off some rust, so I’m ok with this move). He got two outs and went up 0-2 to Ian Desmond, but made a mistake with the next pitch and Desmond hit it out. It happens. After that, Boone Logan (1.1 Ip), Clay Rapada (0.1 Ip), Cody Eppley (1.2 Ip) and even Freddy García (2.0 Ip) chipped in to hold the Nationals scoreless through thirteen innings. Garcia, who got the win, was making his first appearance since June 6th, and only his second since May 21st, but it’s times like these where you’re glad he’s still on the roster instead of a useful position player. Rafael Soriano came in to pitch the bottom of the fourteenth and made it interesting, but he got Bryce Harper to ground out to end the game (Harper went 0-7 with 5 Ks in the matchup and then refused to talk to the media afterwords… the first act of douchebaggery of his career) for his twelfth save. That’s how a bullpen helps you win big games. Well done, gang. This was not a pretty game to watch from an offensive point of view. It was another big time RISP fail game. Before the fourteenth inning, the Yankees were 0-14 with men at the ready. They finally got off the schneid, and it helped them win the game, but first lets discuss the earlier runs. The Nats took a 2-0 lead in the second, and things stayed that way until the top of the fourth, when the Yankees scored a run on an error by Desmond, which cut the deficit to 2-1. In the sixth, the Yankees got some clutch hitting to take a 3-2 lead. Canó singled to open the sixth and moved to third on the double by Swisher. Raúl Ibañez grounded to second, which scored Canó. Swisher’s base running fun times continued when he was thrown out at the plate on a grounder to the mound for a fielder’s choice (to add injury to insult, Swisher hurt his thigh on the play). With Martin now on first, Eric Chavez doubled to give the Yankees their first lead of the game. After that double, it took the Yankees seven innings to get another hit. That hit was a leadoff double by Nix to open the top of the fourteenth. Nix stole second and moved to third on a single by Jeter, before Granderson struck out for the first out of the inning, which brought up Mark Teixeira. Tex smacked a hanging slider from Lidge into the right field corner, which cleared the bases and gave the Yankees the 5-3 lead that would eventually become the final score of the game. Huge hit by Tex, and a big win for the Yankees. It was also the first win this season in which the Yankees failed to hit a home run, running their record in those games to 1-12. I was really hoping for a decisive win in which the bullpen could take a well-deserved day off in this game. Thankfully, Nova and the Yankees did just that in this game. Nova pitched deep into the game and the Yankees used some solo home runs to win this game 4-1. It was the ninth straight win for the Yankees, and their 19th in the last 23 games, as they continue the roll they’ve been on in the month of June. At 40-25, they now hold the best record in the American League, are fifteen games over .500 and lead the division by one game over the Orioles, who simply won’t go away. Just a couple of weeks ago, I contemplated whether or not the Yankees should send Iván Nova to the minors to figure out the location problems. I will gladly admit I was wrong, as Iván was able to make whatever adjustment he needed to make at the big league level. He’s been terrific in his last three outings, including Sunday afternoon against the Nationals. In game three, Nova kept things rolling along, pitching into the eighth inning in dominating fashion. The only blip on his radar was a solo home run by Adam Laroche in the bottom of the second inning. It was the thirteenth home run Nova has allowed on the season, but the first in a couple of starts. His final line looked like this: 7.2 Ip, 7 H, 1 R, 1 BB, 4 K, 97 pitches and his ninth win of the season. He is now the only pitcher in the American League with nine wins. Not bad for a kid who was a non-prospect just a couple years ago. The Yankees didn’t knock the Nationals around in this game by any means, but they did enough to get the win against another solid pitcher for the Nationals, Edwin Jackson. Jackson came into the game with a 3.02 ERA, and pitched alright, but he couldn’t out-duel Nova in this one. 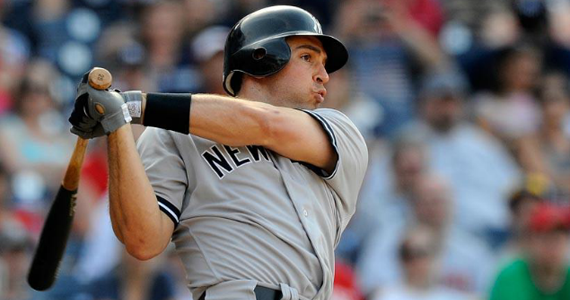 The Yankees scored a run in the top of the first inning on a deep sacrifice fly by Teixeira. 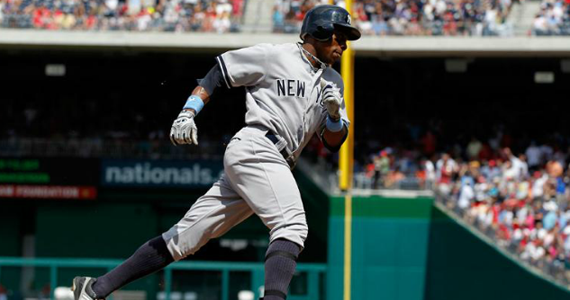 The Yankees didn’t get anything else off of Jackson until the top of the fifth, when Granderson, who is not a home run hitter, hit his 21st home run of the season to give the Yankees a 2-1 lead. In the top of the seventh, Canó’s twelfth home run of the year made it 3-1, and a passed ball allowed Teixeira to score the fourth and final run of the game (Tex had doubled and moved to third on a ground ball). When you get great pitching, like the Yankees have gotten over the last month or so, you don’t need much more than a few runs to win games.